It wasn’t too long ago that anyone who wanted to play online pokies had to do so on their computer. In the early days of online casinos, even that wasn’t always guaranteed: an underpowered laptop might not be able to handle certain software, and a slow dial-up Internet connection could have made playing any online game dicey. But times have changed, and they’ve done so incredibly quickly. Today, not only can any computer easily handle any online casino software, but so can most mobile devices. Whether you’re playing on a tablet or a smartphone, it’s easier than ever to enjoy your favourite online pokies whenever the mood strikes you. How Do Mobile Pokies Work? Playing mobile pokies today is no different from playing an online poker machine on your computer. Many online casinos now offer dedicated mobile versions of their websites, while others offer apps that can be downloaded onto your phone. Even if neither of these are available, it is sometimes possible (though less reliable) to play on the casino’s standard site using your phone’s web browser. Exactly how easy it is to access these games will depend on what the casino offers and what kind of mobile device you are using. Here’s a quick rundown of the experiences you might have based on the kind of mobile device you are using. If you are trying to play mobile pokies using an iPhone or iPad, there is good news and bad news. The good news is that online gambling sites know how popular these Apple devices are, and as such have made sure that their mobile sites are compatible with these phones and tablets. If it’s simply a matter of heading into your browser and looking for a mobile site, you should have little trouble playing mobile pokies on your iPhone or iPad. If you are using a phone or tablet that is powered by Android, you might find that you have a few more options than your Apple-using counterparts. When it comes to mobile sites, you should see virtually no difference: pretty much every online casino with a dedicated mobile site makes sure it works for both Apple and Android users. How Do Mobile Pokies Compare to Other Online Pokies? While mobile pokies have come a long way since they first started being offered, there are still sometimes differences between what you’ll see on your phone or tablet and what is available when playing on your computer. The biggest difference today is simply the fact that not as many games are likely to be available: depending on how you play and what site you are playing on, the mobile version of an online casino might have nearly all of the same pokies, or it might feature just a handful of games for you to pick from. In some cases, the graphics, animations or sounds of a mobile pokie may also be scaled back when compared to the original version as well. 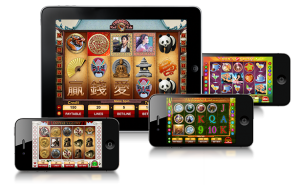 However, as mobile devices become more and more powerful, the differences between mobile and desktop versions of online pokies are becoming less dramatic; in many cases, you can play virtually the same game regardless of how you connect to the Internet casino.